"About 250 people hurling projectiles clashed with police firing tear gas west of Paris, in apparent protest over enforcement of France's ban on Islamic face veils," the AP reported on July 20. Centered in the suburb of Trappes, the turmoil erupted after a woman was ticketed for wearing a face veil (niqab) and her husband was arrested for allegedly trying to strangle the cop. He later walked free pending a court appearance in September. Disturbances persisted for multiple nights and included the torching of cars and a warehouse. Anti-"Islamophobia" activists claim that the officer provoked the man by mistreating his wife, but Interior Minister Manuel Valls has defended both the controversial law and the police. This is not the first violent response to the French prohibition on face coverings. Dozens attacked police in June when officers stopped a niqab-clad Muslim in a Paris suburb. Additionally, an AFP story from August 2012 notes that "a French Muslim woman has been charged with assault and inciting a riot after she refused a police ID check because she was wearing a banned full-face veil" near the city of Lille. Weeks prior to that, "three officers in the southern city of Marseille sustained minor injuries after they stopped a fully veiled woman by a mosque." 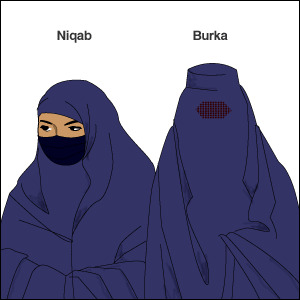 Belgium, another burqa-restricting country, suffered mass violence following a veil-related arrest in 2012. Left: One resident predicted that "Trappes will be Chechnya" in two decades' time. Right: Turkish Americans from across the nation denounced Fethullah Gülen on July 13. Expressing solidarity with those who flooded Istanbul streets to resist the regime of Prime Minister Recep Tayyip Erdoğan, approximately 130 demonstrators, most of Turkish heritage, descended on Saylorsburg, Pennsylvania, on July 13 to condemn Fethullah Gülen, a leading Turkish Islamist. The rally took place near the Golden Generation Worship and Retreat Center where Gülen has lived for years. Attendees waved flags, some bearing the image of Mustafa Kemal Atatürk, and accused Gülen of working with Erdoğan's Justice and Development Party (AKP) to transform Turkey into an Islamic state. They also warned of his efforts in America. "Stop stealing our taxes for your jihad," one poster proclaimed in reference to the dozens of Gülen-tied U.S. charter schools. It was believed to be the first anti-Gülen protest in Saylorsburg. For background, see "Fethullah Gülen's Grand Ambition," published in 2009 by the Middle East Quarterly. "In 1999, Turkish television aired footage of Gülen delivering sermons … in which he revealed his aspirations for an Islamist Turkey ruled by Shari'a (Islamic law)," Rachel Sharon-Krespin writes. "Gülen now helps set the political agenda in Turkey using his followers in the AKP as well as the movement's vast media empire, financial institutions and banks, business organizations, an international network of thousands of schools, universities, student residences (ışıkevis), and many associations and foundations." Also see a 2010 IW article on Gülen-affiliated charter schools in the U.S., which have been in the news recently due to successful pushback against a proposed school in Virginia connected to Gülen's disciples. When Egypt's Islamists hit the streets to decry the "undemocratic" ouster of President Mohamed Morsi, American Islamists followed suit. Most notable was a July 5 White House demonstration described by the Investigative Project as "more about rallying to defend the Muslim Brotherhood than about any high-minded rhetoric about democracy." It was organized by Virginia's Dar al-Hijrah Islamic Center, which "has a long history of supporting both the Muslim Brotherhood and Hamas" and was home to al-Qaeda's Anwar al-Awlaki. Mahdi Bray, former director of the political arm of the Brotherhood-linked Muslim American Society (MAS), demanded democracy amid chants of "Morsi is president!" Another pro-Morsi event graced Chicago on July 7. Furthermore, a June 30 rally in Dearborn, Michigan, sought to bolster Syrian dictator Bashar al-Assad. "We strongly support President Assad," signs read, and participants opposed U.S. aid to Syrian rebels. Speakers included Arab American News publisher Osama Siblani, who was previously criticized for defending terrorists and running articles by anti-Semites. Hassan al-Qazwini of the Islamic Center of America, which mourned Hezbollah's spiritual guide in 2010, also spoke. Organizers "nearly lost control of the crowd" when counter-protesters with "rebel flags" arrived, but sectarian violence of the sort already feared in Britain was averted — for now. Left: Fans of Mohamed Morsi assembled in Washington, D.C., on July 5. Right: A group of Canadian Muslims and their allies rejected Islamic extremism on June 9. Progressive Muslims Institute Canada (PMIC) held a rally in Toronto's Queen's Park on June 9 to declare a commitment to Canadian values and condemn armed jihad. PMIC's honorary director Arshad Mahmood went so far as to apologize for failing to speak out sooner. "I choose to stand here today and tell everyone that I am disgusted at the horrific acts performed by terrorists in the name of my religion," he said. Unfortunately, the event was a small one — around two dozen people — with the Toronto Star pointing out "a stack of unused signs." As with past demonstrations by anti-Islamist Muslims, such as a 2012 protest defending the New York Police Department, reaction among non-Muslims has ranged from the enthusiastic to the dismissive. The proper view is in between: Reform-minded Muslims deserve acknowledgement and support in the struggle against Islamic supremacism. However, one must not underestimate the challenges that they face in a Muslim community dominated by powerful Islamist groups.